A confession: I've barely read any Stephen King. As a teen, he fell very clearly on the wrong side of the then (for me) unbreachable wall between fantasy and horror. While that iron curtain of genre purity had long since fallen, I'd never particularly thought about revisiting King until recently. What happened was that in response to a spot of writer's block my wife bought me his highly regarded On Writing. And before I got stuck into King's advice, I thought I'd better sample his work first. And she was right - it's great entry point into King. For starters, it's science-fiction! 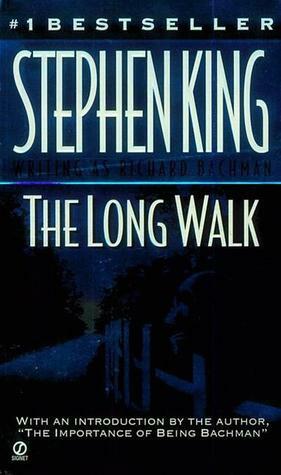 The Long Walk (1979) is one of the early novels he originally put out as Richard Bachman: a pseudonym designed to accommodate his prolific work-rate and (I suspect) give him freedom to experiment away from the King brand. Interestingly, it's also the first novel he actually began writing while a university student in the mid-sixties, and whatever revision it underwent before final publication its roots in that turbulent period still show through. The story follows a hundred teenage boys on a long-distance walking contest through an alternate-history New England. Non-stop, day and night, if the walkers slow down too much and too often, they are shot by the accompanying armed guards. Last kid standing wins the adulation of the watching crowds, and anything their heart desires. This is a great idea. More importantly, it's a great metaphor, fecund in its range and application. One of science-fiction's great gifts is to hold an absurd mirror up to aspects of contemporary life and most obviously, The Long Walk reads as a fable of how America ate its own young in Vietnam and celebrated them as heroes. But the brilliance of the novel is that it transcends that specific reading to become something altogether more timeless. It does no violence to it to make the walk stand for any conflict where the lives of doomed youth are wasted. It's a surprisingly small step even to talking it up as an existential journey comparable to those offered by Camus. Or, after Marcuse, a vision of a thanatotic society in love with death. Whether such expansive readings were intended by King is a moot point. Certainly, the little absurd touches like the authoritarian figure of the nameless Major who oversees the race and the walkers' conversational digressions into pop philosophy help. Regardless, it remains the case that in writing The Long Walk he hit not just on a plot of genius with a haunting life beyond the page, but a story which plays to his acknowledged strengths. Since practically the entire speaking cast are young men doomed to die, his gift of voicing memorable teenage characters to empathise with (and then mourn) is on full display. And with most of the action being set in King's home state of Maine, he takes the reader through a landscape - urban and rural - that he knows very well. This level of geographical detail contrasts well with the less-is-more approach to the rest of his world-building; the reader knows little of the dystopia in which The Long Walk is set because neither do the young walkers we follow. But above all, the story has momentum. 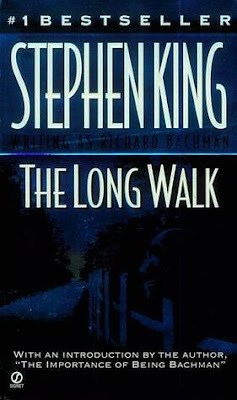 Stephen King is a writer who repeatedly makes you turn the page and the walk is one long unspooling narrative which compels you to follow it till the very end. Together, they fight crime are unstoppable make for a book to devour as quickly and intensely as possible. The novel is not perfect - I sensed that King was on the treadmill as much as his protagonists. Under that pressure, neither the interaction between the walkers nor their in-character storytelling works all of the time. And the ending - although pleasingly ambiguous - is a little rushed. But as a sustained piece of bravura writing atop that darn beautiful plot device, The Long Walk is a feat you don't come across that often. Putting his better-known work in horror to one side for a moment, this book alone will ensure that King's name will last.